Amsterdam is the bicycle capital of Europe and one of the most bicycle-friendliest cities in the world. It is the best way to get around in Amsterdam. Most of the Dutch people cycle to work despite of weather conditions. In 2012 there were about 881,000 bicycles in Amsterdam according to the municipality. That means that there are more bicycles in Amsterdam than the number of residents. With this amount of bikes it is not surprising that many bikes are stolen in Amsterdam – over 200 a day. That’s why most people use two or more slots per bike. Cyclists are respected by all other traffic and most of the streets in Amsterdam have separate bicycle paths. Almost half of all the traffic streams in Amsterdam are by bike. This is the result of the safe and comprehensive cycle path network, the Dutch bike culture and city wide bike promotions. Cycling is a cheap way to get around in Amsterdam and it will keep you fit. Most of the people don’t use cycle helmets as seen in other countries. Dutch car drivers have very good awareness of cyclists and will give way where necessary. Cycling in Amsterdam is safe and therefore you will see a lot of locals cycling with their kids on special child seats or in so called cargo bikes. 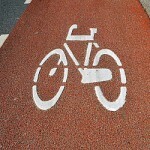 Use the bicycle lane or track, marked with white lines and bike symbols. Do not cycle on footpaths and in shopping streets. Never leave your bike unlocked. Always lock your bike to something unmovable, preferably a bike rack using two locks. Always give right of way to buses, trams and taxis. Also give right of way to all traffic approaching from the right, unless otherwise indicated. 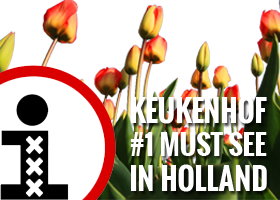 Do not imitate the Dutch by not giving right of way, cycling through red lights or through pedestrian areas. Be careful crossing tram tracks (do so at an angle of 90 degrees). Indicate before changing direction: look behind you and put out your arm if you intend to turn a corner. Turn on your lights after dark. 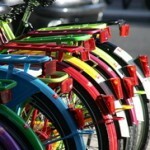 There are many places throughout the city where you can hire bikes. Note that a lot of hotels and hostels provide bikes as well. Biggest bike rental company in Amsterdam on several locations. Red town-cycles with the MacBike logo, touring cycles and also special bikes like tandems and cargo cycles. Bike rentals and guided cycling tours of Amsterdam. “Undercover” rental bicycles, which means no big signs on the front of the bike advertising that you are a tourist. They offer guided cycling tours. Experience Amsterdam on a real “Granny” bike, the most traditional of all Amsterdam bikes. The first bike rental company in Amsterdam started with guided bike tours.